Maug, at the far-northern tip of the Commonwealth of the Mariana Islands, is a sunken volcanic caldera large enough to sail a large ship inside. Inside the caldera, carbon dioxide seeps up from under the sea floor, lowering the pH of the surrounding water and mimicking conditions expected world-wide by the end of the century due to ocean acidification. In this photo, you cans small bubbles rising up from around volcanic rocks covered in algae. 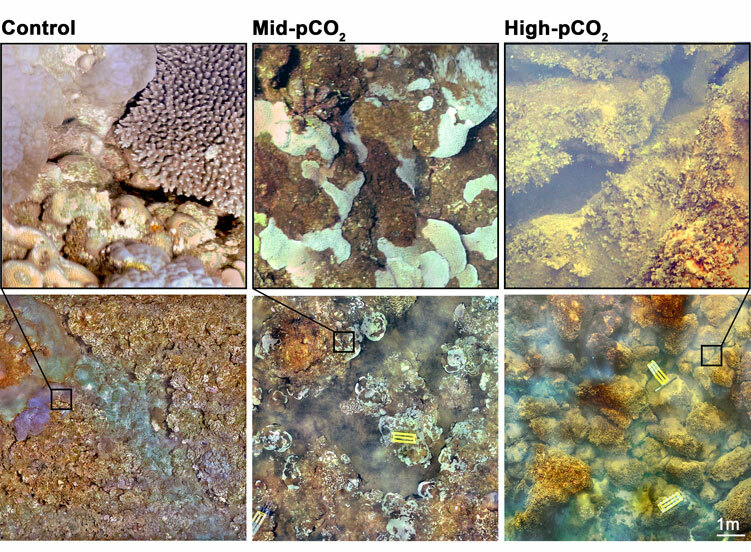 In order to see how high carbon dioxide and ocean acidification conditions were influencing the reef ecosystem, we created high-resolution photomosaics at three sites spanning the pH gradient. The lower images in the panel each cover roughly 10 x 10 meters of reef and the top images are zoomed in to show the high level of detail, essential for accurately identifying the species present. The control site was was healthy reef and as we moved closer to the vents, from mid- to high-pCO2, coral cover dropped while algae increased. This site illustrates how ocean acidification can encourage a shift from a healthy reef ecosystem to less-desirable, algae-covered rocks. Ultimately, data from Maug paints a bleak picture for what may occur in the next 100 years to do rising anthropogenic carbon dioxide. Our research at this site was featured in the documentary "Maug's Caldera: A Natural Laboratory," on PBS. The film is a collaboration between Changing Seas and Open Boat Films. You can download and watch the full episode here.